Burch expects the audience, like himself, to enjoy rediscovering this classic that has colored so many other pirate stories. From the parrot screaming “pieces of eight, pieces of eight” to the ominous song about “fifteen men on the dead man’s chest,” all appear in Stevenson’s grand sea-going adventure first published in 1880s and all are faithfully reproduced in the Book-It style that uses narration as well as dialogue straight from the book. 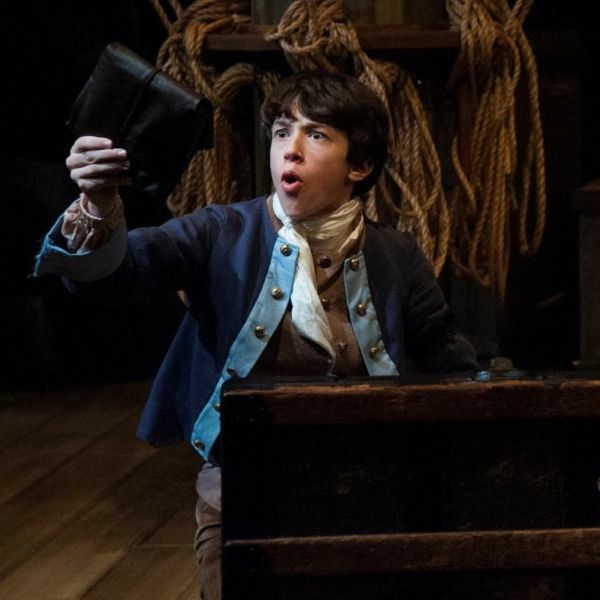 For the adapter Burch and the director Corey McDaniel, more important than a treasure map marked with an X was Stevenson’s decision to tell the story largely from the view of a 12-year-old boy, Jim Hawkins. “It’s Jim’s story and his point-of-view is that of a boy,” said Burch, which made it easier for the team to create tension around the hero's understandable confusion concerning the motivations of the adults that he encounters. The novel’s most memorable passages come from Jim’s often conflicted friendship with Long John Silver as the pair hunt for Captain Flint’s buried treasure. 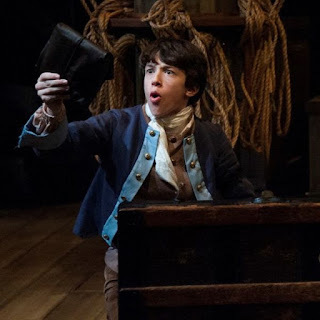 The Book-It production has the veteran character actor Geoffery Simmons as Long John Silver opposite the 14-year-old Alex Silva as Jim. “We really have great find with Alex. He’s charming and can handle the dialogue. He makes Jim innocent and talkative and capable,” said Burch. He is also quite flexible, squeezing into the famous apple barrel with ease. “One of my challenges. How to do Jim in the barrel? I thought for a moment that we’d end up with Jack-in-Box Jim, because he needs to speak,” said Burch about a key scene in which Jim learns for the first time that the ship Hispaniola is crewed by mutineers and pirates. “Luckily, by the time we get to it, the apple barrel is almost empty. So it can be tipped on the side.” Sitting cross-legged in the barrel in a way that probably could not be managed by most adults, Silva neatly narrates through that pivotal moment. The rest of the cast, both male and female, tackle being pirates with gusto. On opening night, aided considerably by Tom Dewey’s fine fight choreography, the dozen actors in the cast on stage created enough mayhem for twice their number. “It’s all muskets and swords, we are not going for a bloodbath,” said Burch. Still, the company recommends the production for ages 12 and up due to gunshots and swashbuckling battles. Still, it all ends as a proper boy’s adventure should, with treasure taken safely home, a reminder why this book, dedicated to Stevenson’s American stepson, has remained a favorite holiday gift ever since its first publication. 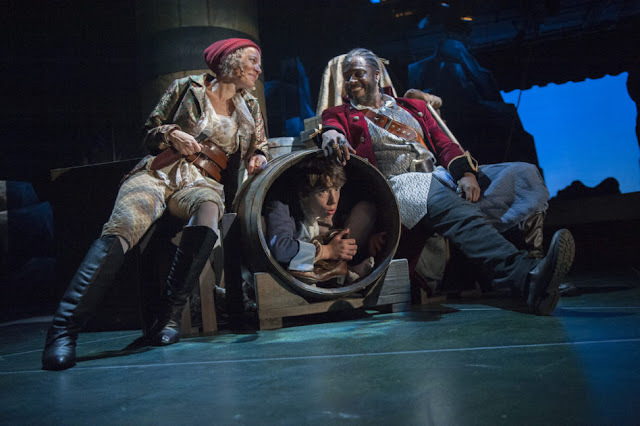 Book-It Repertory Theatre’s “Treasure Island” continues at the Seattle Center through Dec. 24. For tickets, times, and directions, check the company’s website. For more on what makes a great story, check out Burch's website, www.first10pages.com, on why people read a novel past its beginning. Gin Hammond, Alex Silva, and Geoffery Simmons gather round the apple barrel. Photo: Adam Smith.